Packaging fresh fruits and vegetables is one of the more important steps in the long and complicated journey from grower to consumer. Bags, crates, hampers, baskets, cartons, bulk bins, and palletized containers are convenient containers for handling, transporting, and marketing fresh produce. More than 1,500 different types of packages are used for produce in the U.S. and the number continues to increase as the industry introduces new packaging materials and concepts. Although the industry generally agrees that container standardization is one way to reduce cost, the trend in recent years has moved toward a wider range of package sizes to accommodate the diverse needs of wholesalers, consumers, food service buyers, and processing operations. Packing and packaging materials contribute a significant cost to the produce industry; therefore it is important that packers, shippers, buyers, and consumers have a clear understanding of the wide range of packaging options available. This fact sheet describes some of the many types of packaging, including their functions, uses, and limitations. Also included is a listing, by commodity, of the common produce containers standard to the industry. The package must protect the produce from mechanical damage and poor environmental conditions during handling and distribution. To produce buyers, torn, dented, or collapsed produce packages usually indicate lack of care in handling the contents. Produce containers must be sturdy enough to resist damage during packaging, storage, and transportation to market. Because almost all produce packages are palletized, produce containers should have sufficient stacking strength to resist crushing in a low temperature, high humidity environment. Although the cost of packaging materials has escalated sharply in recent years, poor quality, lightweight containers that are easily damaged by handling or moisture are no longer tolerated by packers or buyers. Produce destined for export markets requires that containers to be extra sturdy. Air-freighted produce may require special packing, package sizes, and insulation. Marketers who export fresh produce should consult with freight companies about any special packaging requirements. Additionally, the USDA and various state export agencies may be able to provide specific packaging information. the U.S.. About 40 percent of these are single-use pallets. Because many are of a non-standard size, the pallets are built as inexpensively as possible and discarded after a single use. Although standardization efforts have been slowly under way for many years, the efforts have been accelerated by pressure from environmental groups, in addition to the rising cost of pallets and landfill tipping fees. 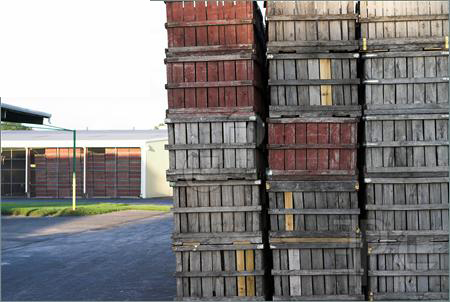 Substantial wooden pallet bins of milled lumber or.plywood are primarily used to move produce from the field or orchard to the packing house. Depending on the application, capacities may range from 12 to more than 50 bushels. Although the height may vary, the length and width is generally the same as a standard pallet (48 inches by 40 inches). More efficient double-wide pallet bins (48 inches by 80 inches) are becoming more common in some produce operations. Although alternatives are available, wooden wire-bound crates are used extensively for snap beans, sweet corn and several other commodities that require hydrocooling. Wire-bound crates are sturdy, rigid and have very high stacking strength that is essentially unaffected by water. Wire-bound crates come in many different sizes from half- bushel to pallet-bin size and have a great deal of open space to facilitate cooling and ventilation. Although few are re-used, wire-bound crates may be dissembled after use and shipped back to the packer (flat). In some areas, used containers may pose a significant disposal problem. Wirebound crates are not generally acceptable for consumer packaging because of the difficulty in affixing suitable labels. Wooden crates, once extensively used for apples, stone fruit, and potatoes have been almost totally replaced by other types of containers. The relative expense of the container, a greater concern for tare weight, and advances in material handling have reduced their use to a few specialty items, such as expensive tropical fruit. The 15-, 20-, and 25-pound wooden lugs still used for bunch grapes and some specialty crops are being gradually replaced with less costly alternatives. Wire-reinforced wood veneer baskets and hampers of different sizes were once used for a wide variety of crops from strawberries to sweet potatoes. They are durable and may be nested for efficient transport when empty. However, cost, disposal problems, and difficulty in efficient palletization have severely limited their use to mostly local grower markets where they may be re-used many times. There are numerous styles of corrugated fiberboard containers. The two most used in the produce industry are the one piece, regular slotted container (RSC) and the two piece, full telescoping container (FTC). The RSC is the most popular because it is simple and economical. However, the RSC has relatively low stacking strength and therefore must be used with produce, such as potatoes, that can carry some of the stacking load. The FTC, actually one container inside another, is used when greater stack- ing strength and resistance to bulging is required. A third type of container is the Bliss box, which is — constructed from three separate pieces of corrugated fiberboard. The Bliss box was developed to be used when maximum stacking strength is required. The bottoms and tops of all three types of containers may be closed by glue, staples, or interlocking slots. Almost all corrugated fiberboard containers are shipped to the packer flat and assembled at the packing house. To conserve space, assembly is usually performed just before use. Assembly may be by hand, machine, or a combination of both. Ease of assembly should be carefully investigated when considering a particular style of package. When the liner is printed after the corrugated fiberboard has been formed, the process is known as post printing. Post printing is the most widely used printing method for corrugated fiberboard containers because it is economical and may be used for small press runs. However, postprinting produces graphics with less detail and is usually limited to one or two colors. High quality, full-color graphics may be obtained by preprinting the linerboard before it is attached to the corrugated paperboard. Whereas the cost is about 15 percent more than standard two color containers, the eye catching quality of the graphics makes it very useful for many situations. The visual quality of the package influences the perception of the product because the buyer's first impression is of the outside of the package. Produce managers especially like high quality graphics that they can use in super market floor displays. One of the newest trends in produce packaging is the shrink wrapping of individual produce items. Shrink wrapping has been used successfully to package potatoes, sweet potatoes, apples, onions, sweet corn, cucumbers and a variety of tropical fruit. Shrink wrapping with an engineered plastic wrap can reduce shrinkage, protect the produce from disease, reduce mechanical damage and provide a good surface for stick-on labels. A great variety of materials are used for the packing of perishable commodities. They include wood, bamboo, rigid and foam plastic, solid cardboard and corrugated fibre board. The kind of material or structure adopted depends on the method of perforation, the distance to its destination, the value of the product and the requirement of the market. Materials used for manufacture of wooden boxes include natural wood and industrially manufactured, wood based sheet materials. sacks made of synthetic materials and paper due to cost factors, appearance, mechanical properties and risk of infestation and spreading of insects. Sacks made of polypropylene of type plain weave are extensively used for root vegetables. The most common fabric weight is 70-80 grams per square meter. Labour cost in handling is greatly reduced. Transport cost may be reduced. Goods are protected and damage reduced. Mechanized handling can be very rapid. Through high stacking, storage space can be more efficiently used. Pallets encourage the introduction of standard package sizes. In designing export packages, their handling on pallets for shipping or for transport and storage within the importing country, is an important factor. The most common pallet size is 1200 mmx1100 mm. Reduction of moisture loss from the product is a principal requirement of limited permeability packaging materials. A solution to moisture loss problems from produce appeared with the development and wide distribution of semi permeable plastic films. Airflow through the ventilation holes allows hot fruit or vegetable to slowly cool and avoid the buildup of heat produced by the commodity in respiration. Holes are also important in cooling the fruit when the packages are placed in a cold storage, especially with forced air-cooling. Ventilation holes improve the dispersal of ethylene produced. The function of cushioning materials is to fix the commodities inside the packages and prevent them from mixing about in relation to each other and the package itself, when there is a vibration or impact. Some cushioning materials can also provide packages with additional stacking strength. The cushioning materials used vary with the commodity and may be made of wrapping papers, Fibreboard (single or double wall), Moulded paper pulp trays, Moulded foam polystyrene trays, Moulded plastic trays, Foam plastic sheet, Plastic bubble pads, Fine shredded wood, Plastic film liners or bags. The normal composition of air is 78% Nitrogen, 21% Oxygen, 0.03% Carbon dioxide and trees of the noble gases. Modified atmosphere packaging is the method for extending the shelf-life of perishable and semi-perishable food products by altering the relative proportions of atmospheric gases that surround the produce. Although the terms controlled atmosphere (CA) and modified atmosphere (MA) are often used interchangeably a precise difference exists between these two terms. This refers to a storage atmosphere that is different from the normal atmosphere in its composition, wherein the component gases are precisely adjusted to specific concentrations and maintained throughout the storage and distribution of the perishable foods. Controlled atmosphere relies on the continuous measurement of the composition of the storage atmosphere and injection of the appropriate gases or gas mixtures into it, if and when needed. Hence, the system requires sophisticated instruments to monitor the gas levels and is therefore practical only for refrigerated bulk storage or shipment of commodities in large containers. If the composition of atmosphere in CA system is not closely controlled or if the storage atmosphere is accidentally modified, potential benefit can turn into actual disaster. The degree of susceptibility to injury and the specific symptoms vary, not only between cultivars, but even between growing areas for the same cultivars and between years for a given location. With tomatoes, excessively low O2 or high CO2 prevents proper ripening even after removal of the fruit to air, and CA enhances the danger of chilling injury. Unlike CaPs, there is no means to control precisely the atmospheric components at a specific concentration in MAP once a package has been hermetically sealed. Modified atmosphere conditions are created inside the packages by the commodity itself and / or by active modification. Commodity – generated or passive MA is evolved as a consequence of the commodity’s respiration. Active modification involves creating a slight vacuum inside the package and replacing it with a desired mixture of gases, so as to establish desired EMA quickly composed to a passively generated EMA. packages or impregnated in the wrappers or into porous materials like vermiculite. With activity respiring commodities like fruits and vegetables, the package atmosphere should contain oxygen and carbon dioxide at levels optimum to the particular commodity. In general, MA containing between 2-5% Oxygen and 3.8% carbon dioxide have been shown to extend the shelf life of a wide variety of fruits and vegetables. If the shelf life of a commodity at 20-25°C is 1, by employing MAP, it will be doubled, whereas refrigeration can extend the shelf life to 3, and refrigeration combined with MAP can increase it to 4. Few types of films are routinely used for MAP, the important ones are polyvinyl chloride, (PVC), polystyrene, (PS), polyethylene (PE) and polypropylene (PP). The recent developments in co-extrusion technology have made it possible to manufacture films with designed transmission rates of oxygen. Vacuum packaging offers an extensive barrier against corrosion, oxidation, moisture, drying out, dirt, attraction of dust by electric charge, ultra violet rays and mechanical damages, fungus growth or perishability etc. This technology has commendable relevance for tropical countries with high atmosphere humidity. In vacuum packaging the product to be packed is put in a vacuum bag (made of special, hermetic fills) that is then evacuated in a vacuum chamber and then sealed hermetically in order to provide a total barrier against air and moisture. If some of the product cannot bear the atmosphere pressure due to vacuum inside the package then the packages are flushed with inert gases like Nitrogen and CO2 after evacuation. An edible film or coating is simply defined as a thin continuous layer of edible material formed on, placed on, or between the foods or food components. The package is an integral part of the food, which can be eaten as a part of the whole food product. Selection of material for use in edible packaging is based on its properties to act as barrier to moisture and gases, mechanical strength, physical properties, and resistance to microbial growth. The types of materials used for edible packaging include lipids, proteins and polysaccharides or a combination of any two or all of these. Many lipid compounds, such as animal and vegetable fats, acetoglycerides have been used in the formulation of edible packaging for fresh produces because of their excellent moisture barrier properties. Lipid coatings on fresh fruits and vegetables reduce weight losses due to dehydration during storage by 40-70 per cent. Research and development effort is required to develop edible films and coatings that have good packaging performance besides being economical. Improved packaging will become more essential in India as International trade expands. Standardized packaging of sized and graded produce that will protect the quality during marketing can greatly aid transactions between sellers and buyers. Better packaging should be of immediate value in reducing waste. Much background research on packaging of perishable products and flowers is needed simulating the actual handling conditions expected during marketing. M.Mahadevah and R.V.Gowramma.1996. Food Packaging Materials. Tata- McGraw – Hill Pub. Company, Limited, New Delhi. Heiss, R.1970. Principles of food packaging. An International guide. P.Keppler Verlag KG, Heusenstamn, Germany. Wilmer A.Jenkeins and James P.Harrington. 1991. Packaging foods with plastics. Technomic publishing company, Inc., Pennsylvania, USA.